Enchanted Excurse: Are You Telling Yourself The Truth? Mawnin' Loverlies! I finally received William Backus and Marie Chapians' Telling Yourself The Truth: Find your way out of Depression, Anxiety, Fear, Anger, and other common problems by applying the principles of Misbelief Therapy. I thought I would share what the contents are first. 1. What Is Misbelief? 2. Do We Really Want to Be Happy? 14. What Must I Do to Be Miserable? I wanted to try this book to see if it would help me in anyway. It is not a very long book, but it took me a few days because it's emotional and about trying to help yourself. 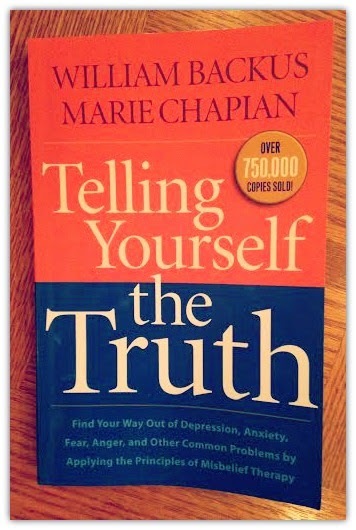 This book teaches us about Misbelief therapy, which are basically the lies we tell ourselves. Example: I am Dumb, I am worth nothing, I will not be successful. It also teaches us how to find the truth and get rid of those misbeliefs, I wish it was as simple as it says. I am hoping I am able to use this in my life though, and maybe I can finally not be as depressed, anxiety, etc. It takes time though! This book may not help everyone, because there are some folks who do need their medicine. But I don't see the harm in anyone reading this book. You never know you might read something you just didn't know about, and that may help you start on your road to healing. This book is christian belief based, which I thought made it even more awesome. I always like when they put scriptures in self help books like these. I believe it gives me more hope and understanding sometimes. So find a copy and try it out for yourself! :) Ta Ta For Now!